Democratic Intuition as a whole poses questions about how one can approach ideas of the democratic, founded on the simultaneous recognition of alterity and ipseity, in relation to the daily-lived experiences of the subjects that occupy southern Africa. The project focuses on the ways in which democracy is something that is inscribed within the individual from various institutions and how without access to the knowledge of how to use the state and its apparatuses, a subject can forgo claims to democracy. Together, these chapters seek to uncover the manner in which individuals invest intense emotional energy into others and objects and how these investments play out in relation to the democratic. In “Comrades II”, Mokgosi pays close attention to the ways in which language was used to articulate the fight for freedom and questions how the idea of democracy continues to shape the current state of citizens’ experience and reciprocation of democracy. The exhibition’s title engages the term “comrade,” with its political resonance and implication of egalitarianism, supposedly cutting across gender, racial, ethnic, and class lines. In southern African liberation movements and politics, comrade was specifically used to refer to members of particular parties. In the context of this exhibition, Mokgosi employs the term to complicate its supposed equalizing force. The texts accompanying the figurative paintings are referred to as dinaane (loosely translated in English as “stories”). The words are rendered in a range of legibility, echoing their origins in an ever-changing oral tradition; rather than the additive process of applying paint to canvas, the text panels have been created by bleaching the surface of the linen, resulting in a simultaneous presence through absence. No translations are offered in order to honor their specificity while at the same time hinder an appropriative reading from outside its linguistic context. Broadly speaking, historicity strategically argues that history is not something that happens, but as something that unfolds in different directions yet folds the subject into these multiple directions. History, then, is not an event or collections of events, but rather a number of “unfoldings” that bear the mark of things before. So I tend to think of history as something that is always already present. And language plays a key part too, which is why I did not want to translate the word lerato. My reservation about translation has to do with the fact that translation—as a process that tries to close the gap between two languages—is based on Western conventions (here anthropological, there ethnographic) of reality, representation and knowledge. Beyond these old politics within history, the words love and lerato differ in that the Setswana word is commonly used as a proper noun for women. The same cannot be said for the word love, which although poetic, is limited to every other world except for the one in which it can be used daily as a proper noun to summon a mother’s child. Lerato is compelling to me because it is not an abstract and poetic concept that is supposedly opaque and fleeting, but rather it is as concrete as any human subject. 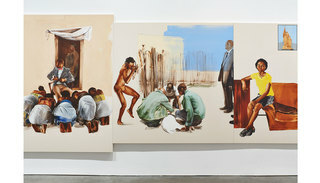 Mokgosi received his BA from Williams College in 2007 and participated in the Whitney Museum of American Art’s Independent Study program that same year. He then received his MFA from the Interdisciplinary Studio Program at the University of California Los Angeles in 2011, and was an Artist in Residence at the Studio Museum in Harlem from 2011-2012. His work has been exhibited both nationally and internationally, recently at Göteborg International Biennial for Contemporary Art, Sweden and the Institute of Contemporary Art Boston both in 2015; other venues include the Botswana National Gallery, Gaborone, Botswana; The Hudson Valley Center for Contemporary Art Museum, Peekskill, NY; The Studio Museum in Harlem, New York, NY; the Armand Hammer Museum of Art and Culture Center, Los Angeles, CA; Yerba Buena Center for the Arts, San Francisco, CA; and the Lyon Museum of Contemporary Art, France. His work is included in public collections such as the Studio Museum in Harlem, New York, NY; the Hammer Museum, Los Angeles, CA; the Alfond Collection of Contemporary Art for Rollins College, Winter Park, FL; and the Colby Museum of Art, Waterville, ME. In spring 2017, Mokgosi will have solo exhibitions at the Williams College Museum of Art, Rochester Contemporary Art Center and The University of Rochester’s Memorial Art Gallery.